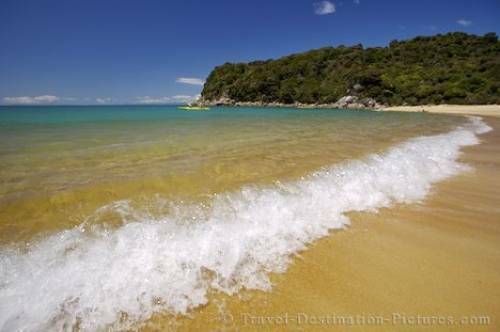 Although the pristine sandy shores of Te Pukatea Bay are accessible by hiking the Abel Tasman Coast Track, another popular way to access it is by way of kayak. Guided day or multi day kayak tours of the Abel Tasman National Park coastline are available from Marahau. After several hours of paddling, Te Pukatea Bay is a great place to rest, enjoy the scenery and a picnic lunch. Te Pukatea Bay in the Abel Tasman National Park of New Zealand.